I'm getting ready for something for which have to get the writing done--have to. I've been paralyzed with anxiety about writing. What worked the other day? Sit down and time myself like Anthony Trollope. He used to write 250 words every 15 minutes for 3 hours a day, by the clock, before he went to work. Every day. Now, you can say what you want about the quality of Trollope's novels (most of them are pretty good), but you can never deny that they are done. I wrote down the time in my trusty black notebook, giving myself 25 minutes (a Pomodoro) to write 200 words in 750words.com. Every time I got up from the desk or looked at email, I had to write it down. Pomodoro after pomodoro until the afternoon when I went for a walk. It worked! I promised myself when I finished 2000 words for the day I could have chocolate. I didn't get to 2000, and I didn't get chocolate, but I got to 1300, which is more than I would have otherwise. Writing before school isn't an option because I get up early and have a long commute, but if I leave at 2:30 the day is still relatively young and I can get some writing done after dinner sometimes. 1. Three weeks ago I gave up FB and advice columns, cold turkey, and I don't miss them. FB was making me miserable because everyone was finishing book proposals, book chapters, etc. and I was not. Deciding there was no need to torment myself, I hung a "gone fishin'" sign on the site and haven't been back--ditto for the advice columns. 2. One of my colleagues who never attends any kind of department meeting and is minimally on campus saw me the other day and said, "Where have you been? I haven't seen you around." I said, "right there in the office and around," and I did not strangle her, so victory is mine. 3. I'm really enjoying my classes. The MLA Job List opens today (September 10) at https://www.mla.org/Resources/Career/Job-Information-List. 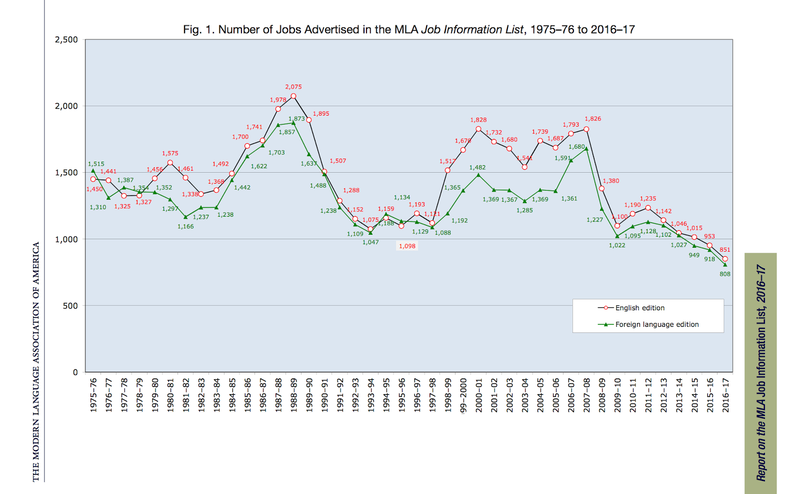 To get a grip on where things now stand, start with the fact that the MLA jobs list has lost its monopoly. The low cost and simplicity of doing things online has meant that advertisements now appear on any number of platforms, including The Chronicle, Interfolio, Higher Education Recruitment Consortium (HERC), HigherEdJobs, and well beyond. Don't forget the jobs at Insidehighered.com, too. If you're looking for information on historical trends (and the now-infamous rosy vision of the Bowen report), here are some links. Off-topic: NYTimes on Joyce Maynard: "Was she predator or prey?" It's been fascinating to see the shift in opinion on Joyce Maynard and her memoir At Home in the World. The whole Salinger thing that she was pilloried for is only a part of the book, and apparently, in another interwebs development I totally missed, everyone is in a pro- or anti-Maynard camp: either "How dare you malign The Great Man?" or "How dare The Great Man have acted so cruelly toward women?" Maynard's take on the relationship, in the new preface, is not so much "what was I thinking to quit Yale and move to New Hampshire with Jerry Salinger?" as "how could he violate my innocence by overpowering me with his adoration? Shouldn't we think of 18-year-olds as girls instead of women?" It's a fair question, but really, who could have stopped her or any of us at 18? That's not a hornet's nest I'm willing to wade into in this space. . . . When she shows up at Salinger's door in 1997--which I think took a lot of courage, by the way--he tells her that she had the capacity to become something but has become nothing, or something like that. She's obviously made something of herself, having had a successful career, and she is a survivor, but is there anything in what Salinger says? Or is this just another case of a powerful man falling in love with an image that he creates and trying to destroy the image when she turns out to have a voice of her own? In case you didn't know, Maynard was pilloried by a lot of people for writing the memoir of her own life simply because Salinger was part of it, as though the Great Man's privacy could never be disturbed. The attacks were really vitriolic. Chief among them was Jonathan Yardley in the Washington Post and Maureen Dowd, who took a day off from being Inspector Javert to Hillary Clinton's Jean Valjean to excoriate Maynard for being a "leech woman" (and got the point of that movie wrong, but anyway). Last fall, when word of Harvey Weinstein’s abuses of women in the entertainment industry overtook the press, followed by near daily revelations about other prominent and respected men accused of similar violations, I supposed this was the moment when my own experience might be seen in a new light. I thought my phone would ring. Exactly right. Maynard has always mined her own life for material, but has she done so more than an Updike, a Mailer, a Roth, or, yes, a Salinger? What's fascinating is that the comments in the comments section are squarely on Maynard's side. There's no one grousing about style (as Yardley did) or how dare she expose Salinger. The tide has shifted, it seems, even if no one picked up the phone to call Maynard for an interview. Maybe there really is a sea change in attitudes.